Dental implants are a great solution for replacing missing teeth. They are strong, long lasting and look like a real tooth. At Mount Road Dental Surgery we have the skills, knowledge and technology to offer our patients a long term solution for missing teeth. Unlike dental bridges or removable dentures, dental implants provide a more robust and permanent option to filling gaps in your smile. A dental implant consists of a titanium screw which is fixed into the jaw bone. The screw acts just like the root of a tooth and supports the abutment which holds the dental crown. Dental implants are more stable than bridges and dentures and look just like a natural tooth. 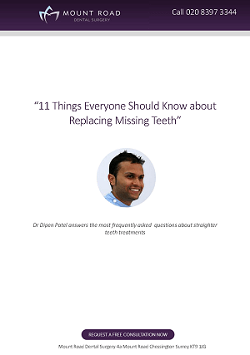 We are proud to offer free consultations to discuss replacing missing teeth. Can dental implants be used as an alternative to root canal treatment? How many implants might you need? The procedure requires a series of treatments over several weeks as the implant screw will need time to heel and bed into the jaw bone. Once the course of treatments are completed the dental implant will only need to be checked during routine appointments. It will last for many years making this treatment option a worth while investment providing the patient with the confidence to talk, eat and smile with ease. Our dentists would be delighted to discuss your options and answer any questions you have about replacing missing teeth. Please call us on 020 8397 3344 or fill in the form below to arrange a consultation. Because they are fixed in place, implant supported bridgework, crowns or dentures can feel much better than traditional dentures and can help with chewing, boosting the wearer's self confidence and quality of life. They blend into the gums and should look perfectly realistic. There may be some bruising and discomfort after the operation to place the titanium root, but once the implant has integrated and restoration is placed on top, you should not be aware of it in your mouth. You cannot usually remove fixed implants supported teeth yourself, this has to be done by your dentist. However, where implants are used to stabilise partial or full dentures these should be removed at night or as advised by your dentist. Implants are now well established and have a good safety reputation. Very occasionally the implant does not integrate well with the bone. If this occurs, it may have to be removed and, once the gum has healed, it maybe possible to replace it. Most modern implants will last for many years providing regular maintenance is undertaken. How do I clean dental implants? Your dentist will show you how to keep the area clean while the implants are integrating into the jaw. Once the teeth are fitted you should clean them like your own teeth, though you may need to take extra care in certain more awkward areas, and your dental hygienist will be able to tell you how best to do this. Who can fit dental implants? Unfortunately, implant treatment is usually carried out on a private basis, and can be expensive. Whoever fits your implants, whether it be a dental surgeon or a specialist, make sure you are confident that they are suitably experienced and that you are referred to them by someone whose opinion you trust. For more information on Dental Implants or to book a consultation call us on 020 8397 3344.